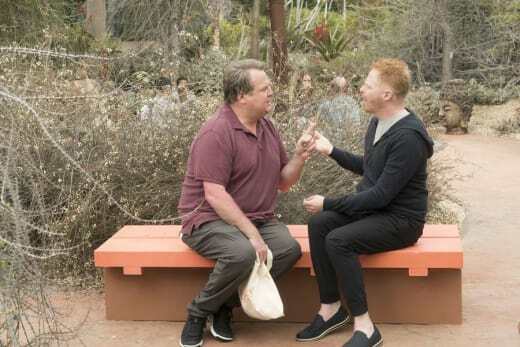 On Modern Family Season 9 Episode 17, the Dunphy girls bring their boyfriends home to meet the parents, Cam and Mitchell work on their marriage and Jay and Gloria are insecure with themselves, again. I think Alex finally lucked out. Bill is awesome! He's down to earth and funny and just what Alex needs. She doesn't need the professor or somebody who brings on the brain; she needs a regular old Joe, or Bill. It's about time she has a good guy in her life since she usually gets the shaft. Did you ever notice how Hayley has great advice for Alex? This isn't the first time she's basically told Alex she needs to chill and not take life so seriously and she's absolutely right. Also, I like the Hayley's pairing too, not because it makes her smarter, but because it seems like her first grown-up relationship. I loved her with Andy, but there was the whole Beth thing, and it started out with cheating. Never good. Dylan, that was just a teen romance, and Rainer Shine couldn't be taken seriously. This is house Dunphy. We fail here. Permalink: This is house Dunphy. We fail here. He was like a cartoon character cliche in human form, and the age difference was icky. This one, though, might just work. This is the second episode in a row where Phil and Claire were acting like a couple again, which was nice. Yes, they have the whole competition thing, but it's playful banter with them, and Claire wasn't bashing him like she normally does, so that was nice to see. If she could stop bashing him altogether, that would make me so happy. Phil is possibly the best husband on TV. He's thoughtful and sweet and kind. Be good to him, Claire! That's gonna be tough, I can smell Cinnabon. Permalink: That's gonna be tough, I can smell Cinnabon. He needs a storyline. He's just kind of there and not really adding to the story. Who is he in the Dunphy household now? Not the little cute kid who uses an extension cord for a belt. Not the girl crazy, kinda sleazy, teenage boy. Who is he now? They could do more with him. Come on, writers, give Luke a goal or something! Then we have Mitch and Cam, still in the dishonest place they frequent so often. Last time they were at the spa, Cam slipped out too! When they were in Vegas, they were both lying to each other about what they were really doing. What's up with that? They need to chill on the lying. I know it's a comedy, but if the show has an ounce of reality, you would think that kind of constant lying and deceit would catch up with them. But it won't because I can't imagine what would happen if they split up and that whole divorce wrinkle was added to the show. Oh, please, don't do that. I beg you. Forget I said that. You're one fire I can't put out. Also, grease is pretty tricky. Permalink: You're one fire i can't put out. Also, grease is pretty tricky. Lately, Jay has been so down on himself, it's disturbing. The last three episodes, his self-esteem has been in the toilet. Stop this from happening. Snap out of it! That's not Jay at all, and it's getting old. Now Gloria, of all people, is going to jump in and start feeling bad about herself? No. This is not character growth! We're going backwards here people. I don't know what has happened to their relationship, but it used to be sweet, and it feels like now they're making the marriage unhealthy. Unhealthy marriages aren't funny. Not even in a comedy. Especially not in a comedy. I'd like to see Jay and Gloria back up a little and have some nice times with Joe. That doesn't happen much. The one who stole the show, according to this, TV fanatic? Bill, the fireman. He was sweet and funny, and I hope things work out for him and Alex so he can stay on the show for a while. I also think Phil's dad is due for another visit. He always brings some joy. Hint. Hint. What did you think of tonight's episode? Are you noticing the downward spiral of Jay? Do you think it's possible Mitch and Cam will divorce? Has anyone seen Lilly? I haven't! Let's talk about the show in the comments. Tell me what you think. Have you been watching Modern Family? Great! If you've missed any of the shows, though, you can catch up here at TV Fanatic and watch Modern Family online to see what we're talking about! In fact, catch up on all your favorite shows right here and talk to other fanatics like yourself. You sound like Austin Powers, man. Permalink: You sound like Austin Powers, man.